7-Eleven will launch an electronic bill pay app that enables consumers to pay bills at the point of sale using cash, per Laura Gordon, VP of brand innovations at 7-Eleven. She spends every day redefining convenience for the thousands of consumers who spend about 2.5 minutes per visit in the store. 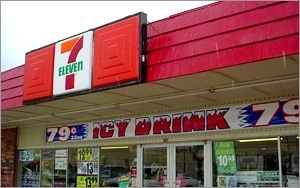 About 1,000 customers visit each of 7-Eleven's 8,270 stores daily in the U.S. and Canada. Some 60% of the people who walk into a 7-Eleven want food and beverage, and the company "needs" to know what they want before they enter the store to make it more convenient, Gordon said. She made the announcement at the OMMA conference at South By Southwest Friday, while participating in a panel discussion with Vinoo Vijay, executive vice president and CMO at TD Bank, and Russell Wagner, vice president of marketing at Mazda. Redefining convenience doesn't mean putting together a marketing campaign. It requires a rethinking of strategies. "We stopped talking about brand or bank marketing, we now talk about brank marketing," Vijay said. TD Bank also combined corporate communications and marketing into one group, and publicized the social mavens for the bank, so they take ownership of social media. "It's their site," he said. "It allows for speed in the way the narrative gets out." Panel participants agreed that listening to trends on social media helps 7-Eleven, TD Bank and Mazda make changes to better serve consumers, but the changes their making requires media, analytics and the ability to listen. Listening requires skill. Marketers know the old purchase funnel doesn't work. It's a thing of the past. Today, it's more of a journey, Wager said. He predicts that "in the future" consumers will have an option to go online, identify a car and search for features, get pre-approved for bank financing online, and find a local dealer. By the time the consumer walks into their local dealership they will have enough information to walk out with a new car within 30 minutes, he said. Wager said more than half of Mazda's budget has moved to digital because it's a little more trackable.